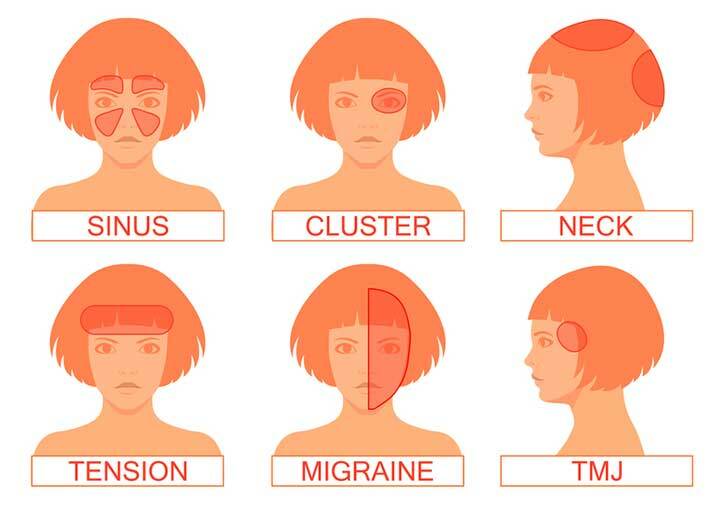 Depending on the headache location, there are between 30 and 150 types of headaches. Whatever the number, it’s enough to give you a headache. When the exact headache location cannot be identified, it is called a generalized headache. Cluster headaches are one of the most painful types. They involve excruciating pain on one side of the head and around the eyes, sometimes affecting the nose and other areas of the face. They’re called cluster headaches because they occur, as the name says—in clusters, and on a daily basis. Pain comes on suddenly and can last from 15 minutes to three hours. Cluster headaches are more common in men than in women and can go into remission for months or years. Exertion (activity-related) headaches are triggered by physical activity, especially lengthy exercise sessions. They usually develop at the height of exercise and subside when the exercise stops, although some can last up to two days. Exercise headaches are more common in adolescents and adults up to age 50. Most of the time, they’re harmless, but underlying and potentially serious causes should be ruled out by a physician. Sinus headaches are often caused by a cold, sinus inflammation, or other viruses or bacteria. The distinguishing characteristic is deep, constant pressure-like pain in the cheekbones, forehead, or bridge of the nose. The pain can get worse with sudden head movement or straining, and can be accompanied by fever, runny nose, and stopped-up ears. Pain from the temporomandibular joint (TMJ) can be easily mistaken for a common headache because the symptoms are so similar. A few differences set TMJ headache apart from tension headaches: a crackling or grinding sound when you move your jaw, stiffness in the jaw joint, tenderness and/or pain in the face, and earaches. Unless you are drinking about 500 mg of caffeine per day (five cups of coffee), you probably won’t have a caffeine withdrawal headache. If you are drinking that much and suddenly stop, you are likely to have a caffeine headache. The problem is temporary, although it may take a few days to get back to normal. The solution is simple: drink less caffeine. Tension headaches are not accompanied by other symptoms. They are usually brought on by fatigue or stress. People who have them describe a feeling of pressure on both sides of the head. Others experience pain that involves the forehead, scalp, or back of the neck. Tension headaches can be mild, moderate, or severe, but not debilitating. However, occasional episodes can develop into chronic, long-term pain. Tension headaches can be caused by contractions of the muscles in the head and neck, and expanded blood vessels in the scalp can contribute to the discomfort. The headaches can be triggered by any number of factors, including an argument with a spouse, traffic, job pressures, working at a computer for long periods of time, and poor posture. Arthritis of the cervical facet joints also might be the cause of tension headaches. A lack of exercise appears to be associated with non-migraine headaches. They are usually treated with over-the-counter drugs such as aspirin, acetaminophen (Tylenol), or ibuprofen (Advil). If you are experiencing them for more than 15 days a month, you have chronic pain and should see a doctor. He or she might prescribe antidepressants, blood pressure medication, or anti-seizure pills. Migraines are often misdiagnosed as sinus headaches because the pain is felt across the forehead and the bridge of the nose. A migraine headache involves recurring episodes (two or more a month) of head pain, plus sensitivity to light and sound. Nausea, vomiting, and neck pain can accompany the pain. Ten to 20 percent of the time the person who is about to experience a migraine gets a warning, called an aura. An aura may be a tingling sensation or visual distortion (seeing zigzag lines) that lasts 10 to 30 minutes. Migraines are triggered by hormonal changes (caused by menstrual periods or estrogen), diet (particularly alcohol, chocolate, monosodium glutamate, caffeine, or marinated foods), bright lights, strong odors, stress, fatigue, or poor sleep patterns. They are triggered when nerves and blood vessels at the base of the brain stem interact to cause pain. Biochemical processes in the brain and vascular disease, respectively, also are potential migraine causes. It is nearly impossible to determine the cause of their migraine episodes without undergoing clinical experiments. Daily fluctuations of variables, such as weather, diet, hormone levels, sleep, and stress, appear to prevent the conditions necessary to determine triggering factors. A physician might suggest changes in sleep or eating habits, and will probably prescribe medicines. Medications called triptans can prevent or treat a migraine. Injectable triptans have an 80 percent success rate, and triptan tablets are thought to be 60 to 70 percent effective in treating migraines. Antidepressants and drugs used to treat high blood pressure also can help prevent migraines. Over-the-counter drugs such aspirin, ibuprofen, and naproxen, also may play a role in prevention of migraine headaches. The drug or combination of drugs that works best depends on the individual. alcohol, antidepressants, arthritis, bacteria, blood pressure, blood pressure medication, brain, caffeine, caffeine headache, caffeine withdrawal, caffeine withdrawal headache, chocolate, chronic pain, cluster headache, cluster headaches, coffee, diet, ears, eating habits, estrogen, exercise, exertion headaches, head pain, headaches, high blood pressure, hormone, inflammation, long periods, migraine, migraine causes, migraine headache, migraine headaches, migraines, neck pain, pain, physical activity, poor sleep, posture, runny nose, seizure, sinus, sinus headaches, sinus inflammation, sinus nasal, sleep, stress, tension headache, tension headaches, tmj headache, treat high blood pressure, triptans, vascular disease, weather.